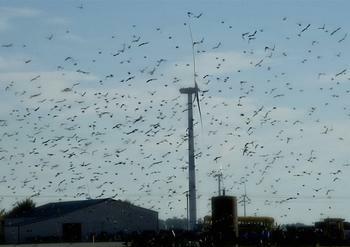 WASHINGTON, DC, May 23, 2011 (ENS) – Birds deserve mandatory, rather than voluntary, protection from the wind turbines that are cropping up across the country, said 56 groups and more than 20,000 individuals in an official comment letter sent to federal officials. The U.S. Fish and Wildlife Service published proposed voluntary wind energy siting and operation guidelines in the Federal Register on March 2, and sought public comments through May 19. As the comment period closed for the Draft Land-Based Wind Energy Guidelines and the Draft Eagle Conservation Plan Guidance, bird conservation groups led by the American Bird Conservancy delivered a comment letter to the agency calling for much stronger protections. Mandatory bird-smart wind standards should employ careful siting, operation and construction mitigation, bird monitoring, and compensation, to reduce and redress any unavoidable bird mortality and habitat loss, the bird conservation groups urge. “Wind power certainly offers hope for a less-polluted future, but we as birders know that location matters and that impacts on birds and other wildlife should be figured into the calculus of costs and benefits of any energy project,” said Jeffrey Gordon, president of the American Birding Association. But the wind energy guidelines as proposed by the Service have divided the conservation community. Also on May 19, another group of conservationists including, Defenders of Wildlife, Audubon, Sierra Club, Union of Concerned Scientists, and Mass Audubon, joined the American Wind Energy Association in comments to the Fish and Wildlife Service. The American Wind Energy Association, AWEA, called both the Draft Land-Based Wind Energy Guidelines and the Draft Eagle Conservation Plan Guidance “unworkable” and made dozens of detailed recommendations to improve the documents. More than 12,000 individuals also submitted comments echoing the concerns raised by AWEA on both documents. According to a survey of AWEA members, the Service’s draft policies jeopardize more than 34,000 megawatts of wind power projects, over 27,500 jobs, $103 million in potential landowner revenue, and $68 billion in investment. The Governors’ Wind Energy Coalition also submitted comments warning that wind energy development would be jeopardized by the Service’s draft policies. The thrust of the AWEA comments and the joint industry and NGO comments is a recommendation to return to the substance of the consensus recommendations of the USFWS Wind Turbine Guidelines Federal Advisory Committee, or FAC. The Federal Advisory Committee was created by the Department of the Interior and composed of wildlife conservation organizations, state wildlife agencies, and wind industry representatives, among others. The FAC worked for over two-and-a-half years and submitted the resulting consensus recommendations to Secretary Salazar in March 2010. But AWEA says the Fish and Wildlife Service draft guidelines “deviate significantly from the consensus FAC recommendations” in key areas, including the role of USFWS in the review process, the scope and duration of pre-and post-construction studies, and the scope of covered species and covered impacts. In the draft guidelines, complains AWEA in its comments, the Fish and Wildlife Service does not offer any explanation for the changes nor does the agency explain what additional conservation benefit would be provided.